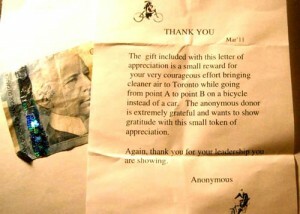 Darren at Toronto Cranks posted on March 2nd about a kind female senior citizen who was handing out sweet letters, which included a monetary gift, to thank fellow citizens for riding a bicycle. I am truly moved by this story so thought I’d share it here. This woman’s simple and hands-on philanthropic gesture thanking random cyclists is genuinely touching, and about as unexpected to most as the ‘Thank You’ cards given by bike riders to considerate drivers were back in ’09. Random acts of kindness will never cease to amaze me – this one is timely and unforgettable and will continue to make my heart a little lighter for years to come. I would love to meet and thank her personally , but no news yet on who she is. There’s also of course the obvious juxtaposition of this gifting $ to cyclists, with the recent refunds doled out to ‘Ford Nation’. I doubt I need to explain the relative impacts on roads, public space, health costs, environment, of cars vs. bicycles… When it comes to our municipal piggy bank however, cycling & walking makes deposits into the community coffers, whereas driving makes withdrawals. Anything that recognizes this, encourages more cyclists, and in turn more ‘sound collective health/environmental/fiscal policy’ should be applauded! This woman’s kind & thoughtful gesture certainly qualifies. Looks like other folks agree – the story has also been picked up by Torontoist. Larger discussion here about subsidies, tax rebates, and the like for cyclists (opens big can of worms…) – any thoughts? ← Smart Living by Bike – Momentum Magazine gets a Re-design! Very effective campaign – especially if old media pick up the story.